After riding only a few hours, it became obvious that a back rest would greatly enhance the comfort of the Helix. This may be a "personal choice" issue, but in my case, it is also driven by a curved, fused-solid spine (if you are interested, its name is "ankylosing spondelitis"). 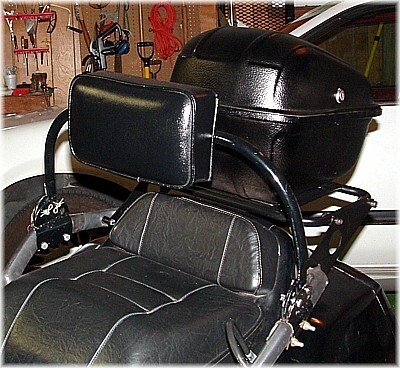 Regardless of personal problems, there are several back rest designs available for the Helix; making it obvious that I am not the only Helix owner who wants to lean back while riding! After studying the backrest that seems to be most popular (at about $160, and demanding seat surgery) and another seen on many German Helices, I was about to design one to use the passenger handhold mounting bolts. 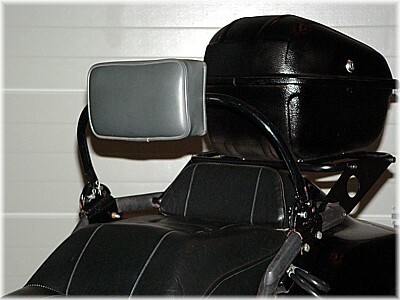 A motorcycle back rest maker was willing to quote me a price; but at one-off I knew it would be in the $200 range. The seller was a fellow-member of the Honda Helix Discussion Board , who was cleaning out his surplus "stuff, " and who included the backrest, an original toolkit (there was none with my Helix,) a new drive belt, and a shorty cover for the windshield-panel area. The price was more than reasonable and the total package made it a safe bet. The check was sent, and a few days later the goodies arrived. Everything was as advertised, and after some experimentation with the rest and mounting hardware (which way do those brackets go? Which of those holes do those pins best match up with?) the rest was clamped in place. Time for a test drive! Around a several mile circuit and back home -- loosen the clamps and bop the mounts with a rubber mallet to "adjust" the fore-and-aft location; back around the test drive. Once the position was set to my satisfaction, it was time to correct the color mismatch. With no experience in the upholstery business, I had no clue about how to "re-color" that gray vinyl cushion. Some Internet research only confused me; off to my friendly auto parts outlet. "Re-color vinyl? Right here on aisle 4...," says the O'Reilly guy. Hhhmmm - that was easy; so it's paint: how was I to know? Dupli-Color Vinyl & Fabric Coating HVP104 Gloss Black. The 11 oz. rattle-can will do a bunch of these little cushions. February 20, 2007; reading the directions (yes, I do!) "- - - Use only when can and surface are between 70F and 90F." Now, that's a problem, because even in Chattanooga it seldom gets above 70F in February; wait! What's this? The sun! And the temperature is .... 71F ! My chief concern is that the paint may rub off on my light colored riding jacket, due to the vibration and abrasion of road rumble. Only time will tell, but about 100 miles around town over several days left no black mark on the jacket. After several weeks of use, and some tinkering with the location, I can say that this is the best accessory investment I've ever made; short or long ride -- all are much more comfortable now! Don't leave home (on your Helix) without a backrest. (June, 2008) After about 3,000 miles of use I can say the backrest is GREAT. BUT lean forward away from the rest if you know you are going to hit a rough place in the road. It is much more comfortable (and safer) to be isolated from the seat back under rough conditions. I've tried to find the manufacturer of the back rest with no success. You may want to fabricate you own, so HERE are close up photos and dimensions. Send me an email note please! ©2006 Bill Laudeman; all rights reserved. Page updated Monday, December 29, 2008 16:06 Eastern time.